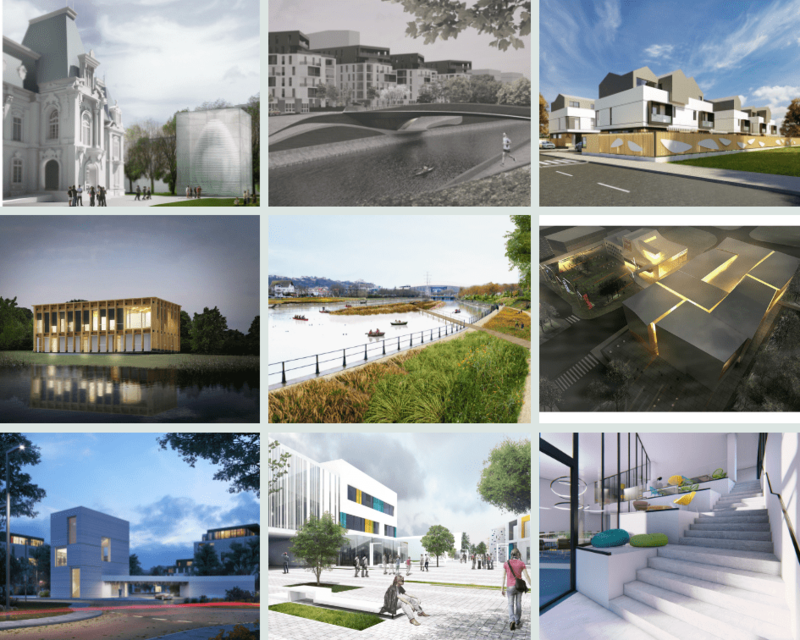 Following an in-depth analysis of all 60 architectural projects signed up in the Romanian Building Awards competition, RBA board members – made up of presidents of the Constitutive Council of Architects in Central Europe (CCA-CEE) – have selected the 12 finalists that will present their projects publicly at SHARE Bucharest 2019 in front of an international jury. The 12 finalists were chosen based on votes from each RBA board member part of the evaluation process. Each member had 12 marks, from 12 to 1 to communicate their favorite project hierarchy. Throughout the process, we’ve maintained a continuous and dynamic evaluation up until the last vot. We will also have 3 special mentions, courtesy of the board, which we will announce during the RBA Gala, namely for research & development, interior design, and public spaces. In our evaluation, we’ve taken into account basic judging principles, including the project’s capacity to improve lifestyle quality of citizens, nature of the concepts guiding the project, innovation and sustainability degree, but also technical and aesthetic qualities. 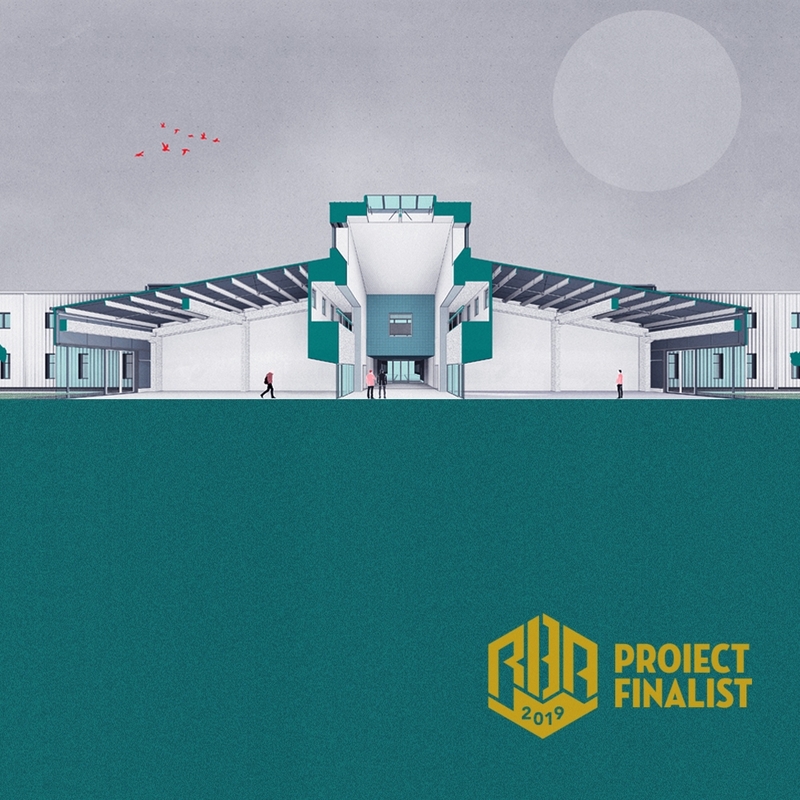 By announcing the list with the 12 nominated architectural projects joining the final race at the Romanian Building Awards competition, the first judging step has ended. Bruno ANDREȘOIU, Architect, Editor-in-Chief at Igloo (Romania). Team: arch. Adrian Untaru, arch. Bogdan Brădățeanu, arch. Andrei Șerbescu, arch. Ioana Tănăsie, arch. Esenghiul Abdul, arch. Andreea Ștefania Precup, arch. Constantin Stanciu, arch. Ana Simionescu, arch. Laura Oniga, arch. Traian Iacob, arch. Theodor Dinu, arch. Mihaela Bâcu. Eng. Luana Sandu – Mechanical, Water supply, electricity: S.C. ALMA INSTAL PRO S.R.L. Eng. Mihai Dima – Structure: S.C. EDIT Structural S.R.L. Arch. Esenghiul Abdul – Pedestrian landscape design: S.C. BEROS ABDUL ARHITECTI ASOCIATI S.R.L. Arch. Christian Beros – Pedestrian landscape design: S.C. BEROS ABDUL ARHITECTI ASOCIATI S.R.L. The project: The site is large enough to accommodate a mix of housing types across private and affordable tenure and for all generations, whether it be together as families, or as individuals and everywhere in between. Type A – Apartments, Type B – Townhouses, Type C – Detached Houses, Type H – Villas, Type S – The Club House. In total, we have 793 units, 5 categories, 44 layouts. By developing a parking system that manages to mask the cars without affecting the efficiency of entry/exit maneuvers the design focuses on the natural and built environment that has a valuable impact on day-to-day living. The project: These new 10 residences is quite spaced with 8-9 meters between houses. Each level is designed as a separate volume so that the mass objects have been designed with the ground withdrawn, withdrawal of the floor from the floor 1 generates an access area being protected . The second level appear as a barn house lifted on top witch generate a particular and iconic image. The project: Following the analysis of the neighbourhoods and architectural style specific to the city of Sibiu, a concept for the new complex was set out to raise the potential of the area. The existing built-up area, the immediate vicinity of the Historic Center, the street tram and the proposed building destination, are elements which were considered in the implementation of the Center. 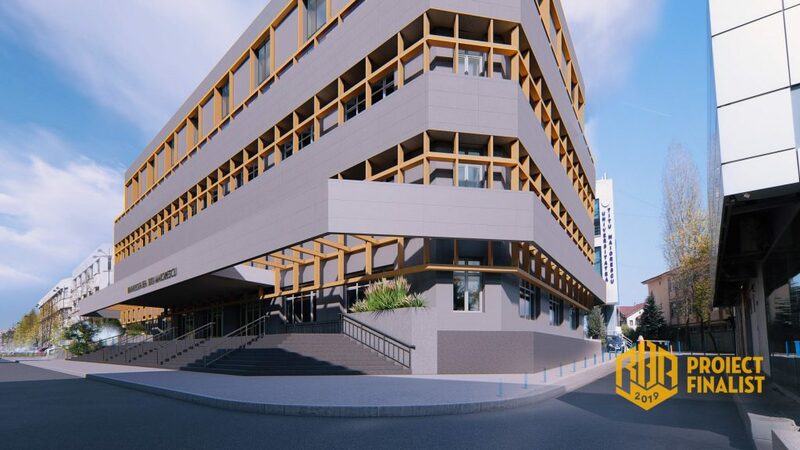 The new complex consists of a theater, hotel, commercial center and cinema, commercial spaces and offices, the info point for tourists with coffee shop, exhibition and conference center and also 470 parking places in a 4-storey underground garage. The project: The buildings’ layout on the site is meant to create a central core, a Plaza that is easily accessible from all directions. Due to its wideness and conformation, the site can’t be crossed quickly, especially by young children. Therefore, we proposed a building layout that opens the Plaza to opposite sides, making it easily accessible and connecting all major areas. Thus, the Plaza is like a living organism that extends and fills every empty space between buildings through a single floor, creating a coherent urban composition that answers both to functional connectivity and aesthetic purposes. 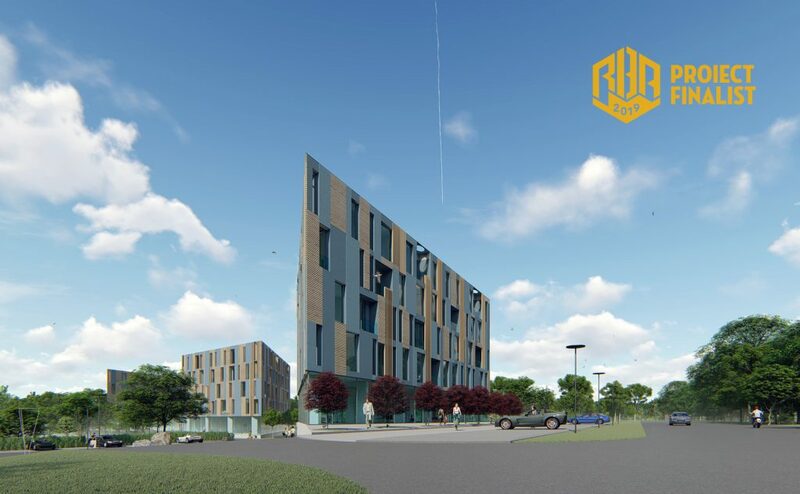 The project: Titu Maiorescu Building V Head Quarter, located on Calea Vacaresti Blvd, 4TH District, Bucharest, is a key building extension, for one of the most well-known, popular, dynamic and high-level private universities in Romania. Supplementary amphitheaters, study laboratories, classrooms and meeting rooms, have been designed and finished with top-quality materials. A metallic structure similar to a container framework, was designed for the extension, placed and hanged over the existing concrete building. The exterior facades and volumes have been designed to be covered with Equitone panels and high energy efficiency glass walls. The interior design was created as a high-tech industrial space combined with interrelated organic spaces. Natural light has been one important detail for the extension’s design, as well as the main building facades’ positioning towards east, south, and west in order to properly sunlight all premises. The project: A two-leveled house comprised of two levels. 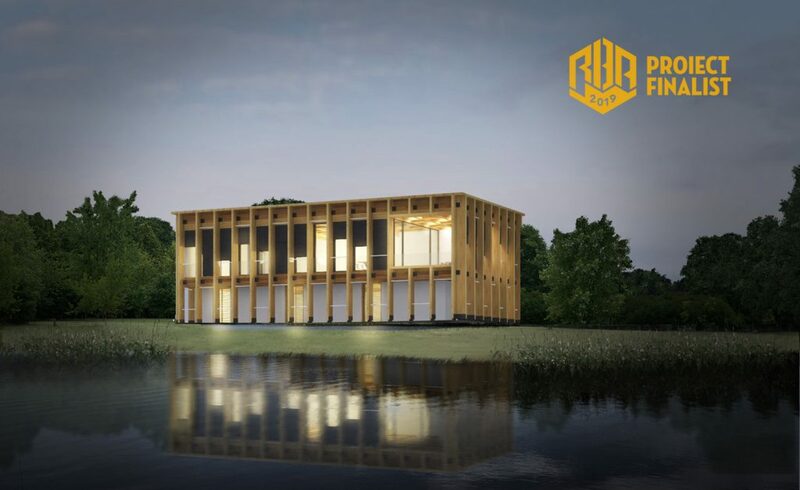 The ground floor contains the bedrooms and the technical space, while the first floor contains the kitchen, the living room, the dining room, the master bedroom and a generous terrace oriented towards the lake. I applied this inversion of the common functional distribution between the levels so that the dwellers can have a more spectacular view over the lake than the view from the level of the ground. 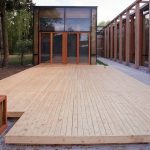 The structure of the house is made of glued laminated timber, with the columns disposed on the perimeter. The columns have also a shading role, and through their regulated rhythm they define a geometric, rationalist architecture, in contrast with the irregular shape of terrain and of the shore. The project: The proposal refers to the story of the Indore Temple that was commissioned by the Yeshwanr Rao Holkar Maharajah from India to Brancusi and has never been built. 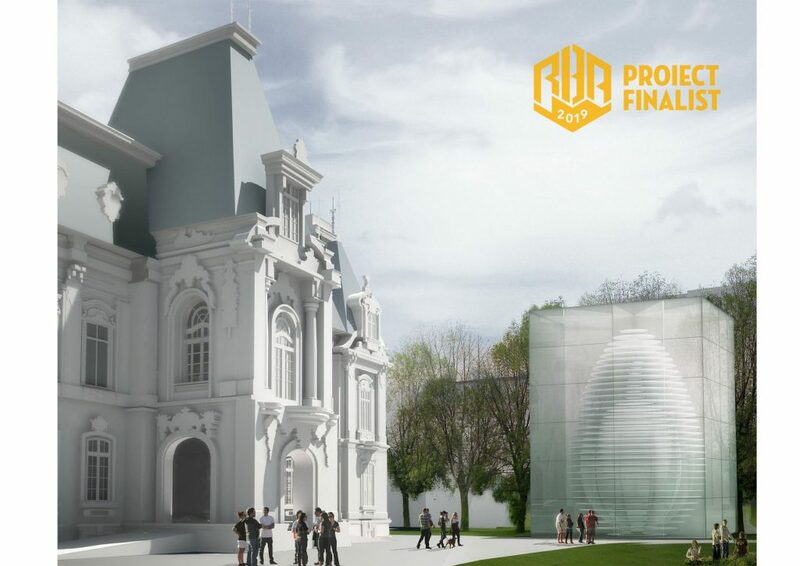 The entrance is set up to be underground: on the eastern side of the Mihail Palace it was proposed an underground space as an exhibition space for meetings and the access in the glass prism that is above. This will be in itself a big structural performance, being made of glass panels of 12 m high. Brâncuşi Pavilion develops a special relationship with the Mihail Palace counting on a mutual architectural support. 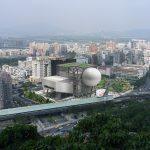 The pavilion can be regarded as pop-art while the “Măiastra” is only suggested as a negative space inside the Ovoid, to avoid generating a heavy, oppressive structure. Team: arch. Vlad Gaivoronschi, arch. Ioan Andreescu, arch. Adina Szitar, arch. 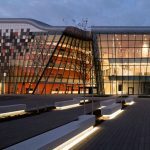 Dan Munteanu, A and B residential S.C. ADNBA srl – arch. Adrian Untaru, Bogdan Bradateanu, Andrei Serbescu, arch. Mihai Danciu, arch. Bogdan Zaha, arch. Catalin Gavrilescu, arch. Ovidiu Micsa, arch. Simina Cuc. Principals: arch. Rodica Dina, arch. Cristina Lupu, Horia Munteanu, Chan-Woo Park, Alexandru Barbu, Anca Teslevici, Romina Pasculovici, Mihaela Bacu, Roxana Durdun. 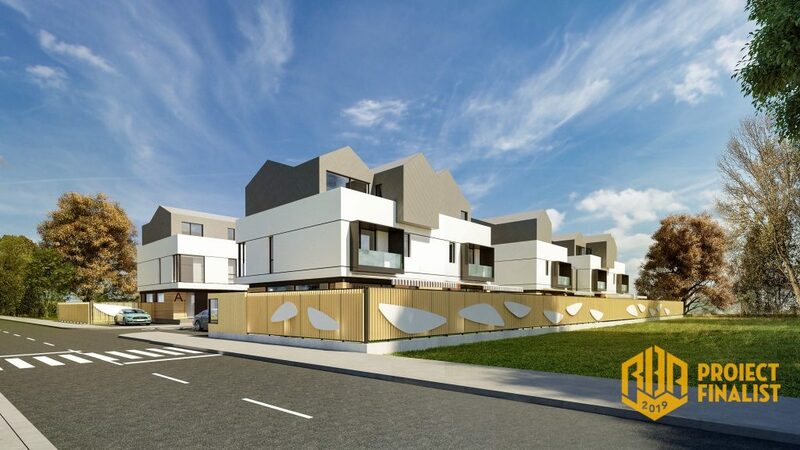 The project: ISHO is a complex mix of functions, a hub of multiple connections which will accommodate: – a segment of the second ring of the city together with a new strategic bridge over Bega. 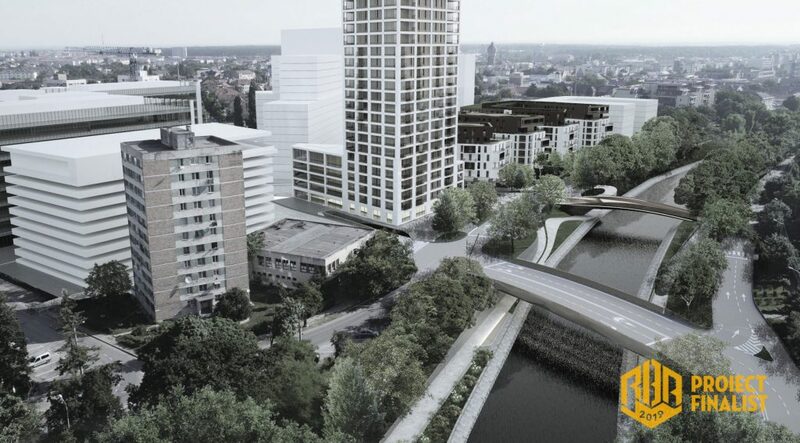 – a second pedestrian bridge which will continue an important pedestrian road connecting ISHO with another historic district in the east of the city with a powerful NW-SE visual direction, oriented towards the massive Millennium Church, a landmark in one of the historic plazzas of the old Fabric district; – ample exposure to the riverfront; – an eastern-western connection, through an old tramway remise (to be converted into a Transport Museum and Cultural Centre). 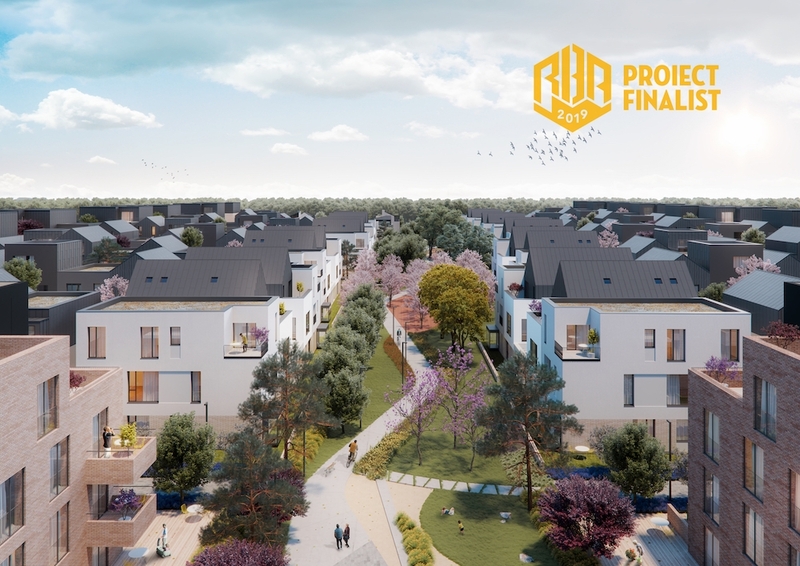 The project: The Housing Complex is a unique concept in Romania and promotes a green living model, being 100% ecofriendly. The three four floors buildings have one-, two- and three-rooms apartments, with a total of 154 apartments. 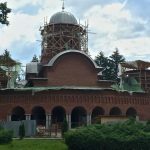 It’s located in the best area of the North of Bucharest, in Mogoşoaia, surrounded by green spaces, between two forests. Each home is unique either by interior design or by partitioning of living space. They are soft-loft-style apartments. The architecture of the buildings is modern, each building has the shape of a diamond and is positioned taking into account the brightness, intimacy and the view. They are designed to bring natural light to the home regardless of the time of day or season. This can be done thanks to the high windows from floor to ceiling (2.9 meters). 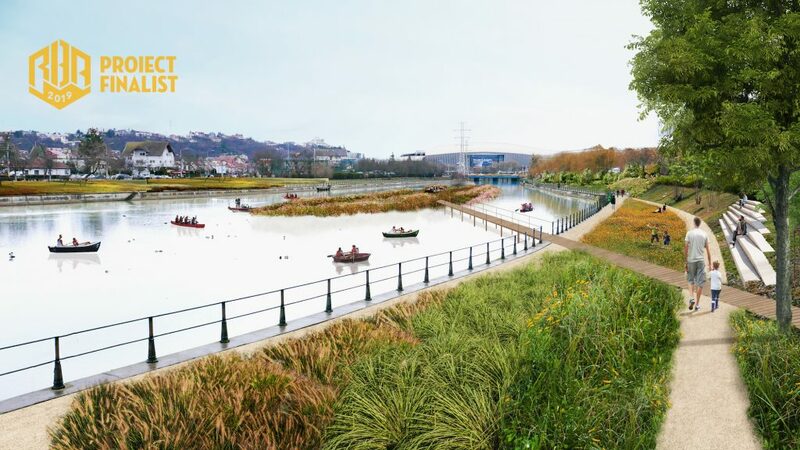 The project: Producing a diverse range of solutions to the varied conditions of the river Somes, this proposal reimagines the role of the river as it crosses through Cluj-Napoca for over 15 kilometers. The Somes River is no longer understood as a thin line that divides the city in half but rather as a thick band that is part of Cluj-Napoca, incorporating distinct ecological systems and integrating public space. 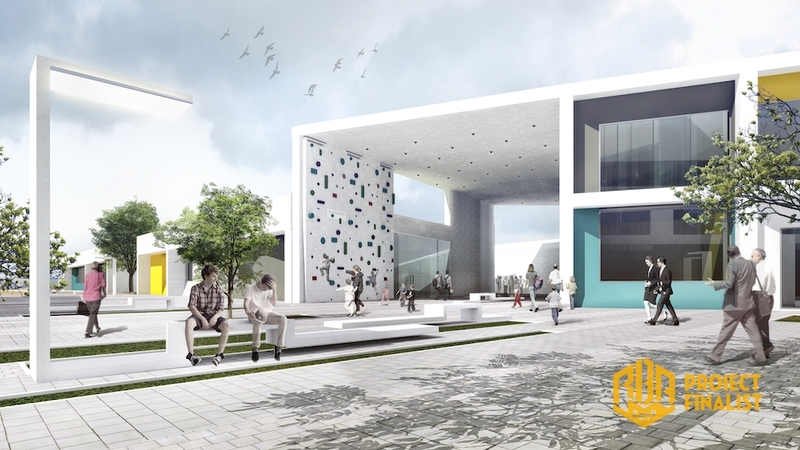 The Somes is envisioned as an urban connector of public spaces and green areas as well as the primary circulation path for pedestrians and bicycles. Thus, this proposal aims to bridge that gap between the river and the city. The project: Unlike the traditional industrial hall, a large rectangular box, the Center has a square footprint, occupying the maximum constructible plot on one direction, freeing the ground for further expansion, in the other direction. Including production, office, presentation and social spaces, the assembly of buildings fit into a 100 / 100m square, with a total built area of approximately 10000 sqm. The client/investor is a group of three companies that produce parts, assemblies and equipment for the electronic industry. The companies currently employ around 100 people and the new facilities will have to accommodate around 200 highly skilled employees. The project covers the need for doubling the production capacity while expanding the client’s vision for a more transparent, adaptable and streamlined working environment. 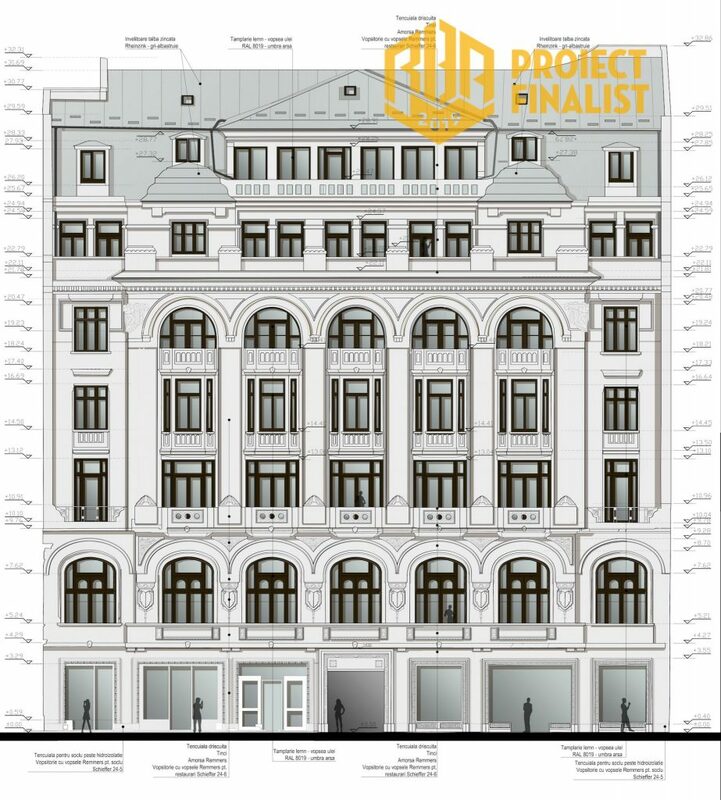 The project: The aim of the project is to reinforce and restore the building and to give it back to Calea Victoriei in order to help it regain its fame of elegance and beauty. The building is one of the most important presences on Calea Victoriei . It is a patrimony building. It has an underground floor, a ground floor, a mezzanine , 5 floors and the 6 th level is retired from the main plan of the facade of Calea Victoriei. It has a total area of 4300 sqm.and a generous attic. The structure has to be reinforced.The facades are for the moment in a bad shape and need to be restored.The roof, too. 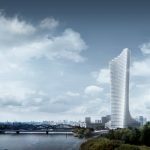 The reinforcement of the building means the reinforcement of the walls of the main staircase The existing two elevators will be changed with an elevator with contemporary technology and glass walls. The missing ornaments of the facades will be remade of the same material and geometry as the original ones. The damaged ones will be restored. Congratulations to all of our participants! 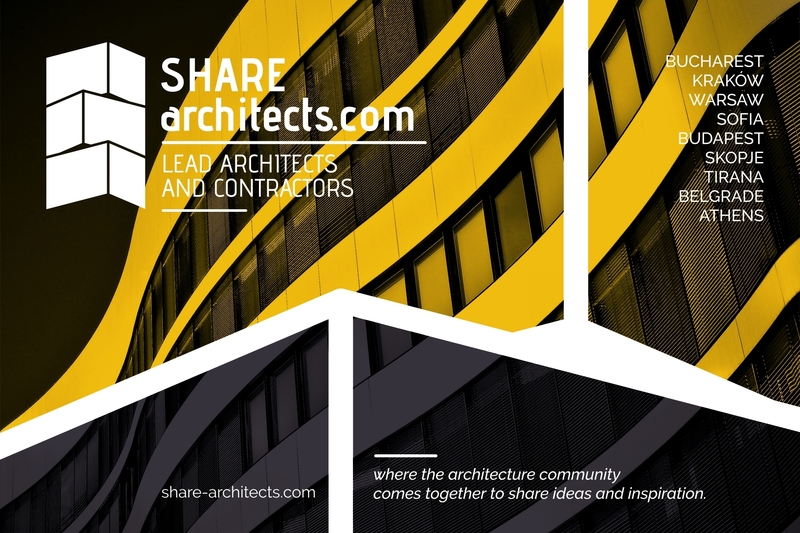 All 60 projects signed up in the competition will be presented at this year’s special edition of SHARE Bucharest 2019. 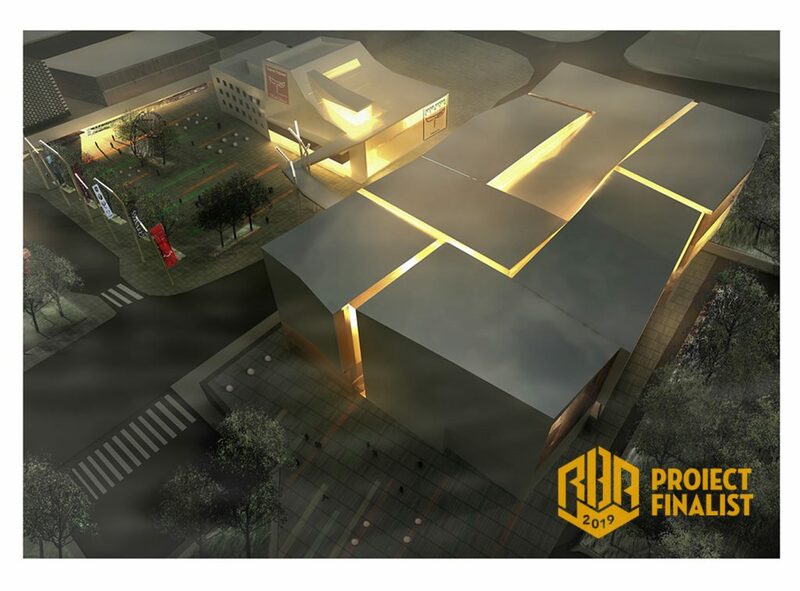 Our dear finalists, see you on April 18, at the Romanian Building Awards Gala where the final stage of the competition will unfold! A big thank you to our collaborators, spatiulconstruit.ro and igloo, as well as to our official partner, Saint-Gobain.